Heroes of Might and Magic IV is a fantasy turn-based strategy game with some fantasy role-play missions. It features many classic fantasy creatures and an inventive take on factions by concept. 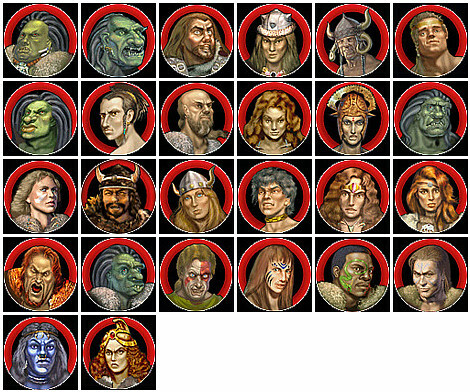 The game art for the creatures are quite classic, but the artwork for the towns sometimes quite chaotic. Our fantasy art galleries include game art from screenshots, movies of cutscenes, and other official media. The Stronghold is based primarily on Might, cannot produce spells or heroes that start out as spellcasters, and makes its home on rough terrain. The creatures that can be hired are the Berserker, Centaur, Nomad, Harpy, Ogre Mage, Cyclops, Thunderbird, and Behemoth. They have no "Magic Hero" and their "Might Heroes", the Barbarians, have a hard time learning magic.